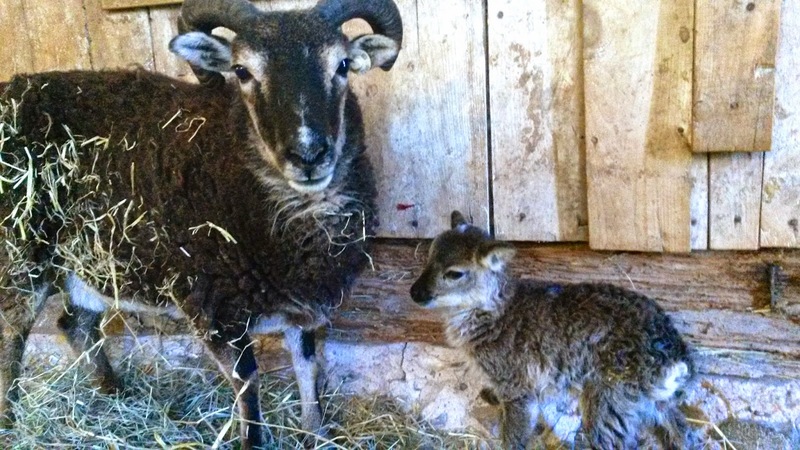 Northern Heritage Farm: Baby Bonanza! The last few days have been quite the whirlwind! Three more lambs were born, and all within 24 hours of each other! Dorrie was the second ewe to lamb. She had a perfect baby girl before dawn on Friday morning. It's such a fun surprise to walk into the barn for morning chores and see a new little face! Dorrie's baby is very quiet and calm. I haven't heard her make a peep yet! She doesn't even complain like the other lambs do if I pick her up. She seems smaller than Eliot was, but I haven't gotten a weight for her yet. She's the darkest out of all the lambs, with solid black legs (so far--these could lighten as she gets older). I've decided to name her Oliver, after my favorite poet, Mary Oliver. I will call her Olive for short. I was tempted to name her Mouse, but meek though she is, it just didn't seem quite right. Dorrie was the only ewe to eat her own placenta, which I found pretty interesting (in the wild, most ewes eat the placenta so as not to attract predators). She's also the only one who often entirely hides her baby--she will nudge baby into a corner and then lay down right in front of baby, blocking your view. It was hard to tear myself away from the new addition, but I had plans in the city on Friday and it's best to leave mama and baby alone as much as possible the first day anyway so they can cement their bond, so off I went. Which of course means another ewe lambed while I was gone! My husband texted me early afternoon to say an ewe had given birth in the little pine grove in the northwestern part of the pasture. I thought for sure it must be Jasmine as she had been looking enormous when I left (and as the only veteran mama, I thought her a more likely candidate for pasture lambing). But when I got home, it turns out it was Daisy! Daisy also gave birth to a little girl, this time a light phase baby, just like papa! She is an absolutely gorgeous little thing, weighing in at 4.8 pounds. Jon joked that since he saw her first, he got to name her, and was thus dubbing her Moxie Woolgiver. After a few hours observing her, I have to say the name suits her awfully well, so I'm breaking my theme and sticking with it. She's a spunky little thing and was already running circles around mama at only a few hours old. I wonder if it makes a difference that she was born outside? She'll readily approach everyone and everything, though she protests quite vehemently if you try to hold her! Dorrie seems to hate her, sadly. Moxie's friendly curiosity toward Dorrie has so far only been met with headbutts. I actually had to put Daisy and Moxie in a jug (smaller catch pen) that first night to keep everyone safe. The weirdest thing happened after Moxie was born; Jasmine started following Eliot around everywhere, licking her and making the standard soft mothering noises at her. Poor thing was definitely ready for her own baby. When I shut everyone into the barn for the night, Jasmine even curled up right next to Eliot. I was pretty sure all this strange behavior meant she was either already in labor, or would be soon. And lo and behold, I was met with another fresh face when I went out to the barn first thing Saturday morning! Yet another girl! I can't believe my amazing good fortune this year. So many other farmers I've talked to had mostly or all boys this year. I was surprised Jasmine didn't twin since I guess she has in the past, but I can't complain too much since she gave me another perfect ewe. I've named this one Rossetti, but will call her Rose for short. I can't quite decide if she's light phase as well--she looks sort of in between light and dark phase. She also has the cutest little shock of white fur on the top of her head! No weight on her yet either, as mama is kind of headbutty. Even though Jasmine is my calmest, friendliest ewe, she seems to be the fiercest mama. She'll still gladly take treats from my hand, but if I look at her ewe, she bobs her head at me. She did actually give me a small warning headbutt this morning. Good thing I was already sitting down and it was just a light tap to my thigh. Next time I think she'll really mean it, so I'll need to be extra careful around her for the next few days. Thankfully everyone seems to be in great health. It's amazing how big Eliot looks already at only 1 week old, compared to the newborns! We had a full day yesterday, with several farm visitors and also a lot of yard work. So I was already worn out from my day (and sunburned to boot, whoops!) when it was time for evening chores. That's when I discovered what nobody ever tells you about lambing: it's a bit like suddenly inheriting a bunch of cranky toddlers at the very moment you were trying to herd cats. At least that's how I felt. I shook the grain pans as usual to get everyone to come inside, but they were having none of it. So little of it, in fact, that not a single ewe took even one step toward the barn. Hey guys, did you hear something? Must've been the wind. Okay, I thought, I'll just nab the lambs and mama will follow. Oh, naive little me. There's no easily catching a little soay lamb on pasture, even if they're less than 24 hours old. They can really book it! And mama positioned herself between me and the lamb every single time anyway. We circled and circled and circled for nearly an hour. I was thiiiiiiiiis close to giving up and letting them sleep in the pasture all night long (the only reason I didn't want to is with the lambs so little, I worry about aerial predators) when I was finally able to nab a lamb and lure mama inside. Once I had one, it was then easier to convince the others to head inside as well. Eliot introduces herself to Olive. I hope after another full day of getting to know each other and come and go from the barn as they please, that these shenanigans won't be repeated tonight! Meanwhile, Eliot is already starting to enter the teenager phase, where no amount of mama bellowing can recall her. She loves to hang out with the alpacas. Jon said that yesterday he saw her climbing all over Gus while Gus was sunning himself! I'm bummed I missed it, but I'm sure I'll see similar happenings in the coming days and weeks. Just found your website. Sooo fun reading about your three lambs, it's like having a flock of my own. Thank you for such good descriptions! And congratulations on the good luck of three girls all at once! Hope they've all grown healthfully! I'm fascinated with Soays, after studying ancient seafaring trade routes and placenames for years now. Any ideas on how the Mouflon was brought to the isles of Scotland? Any thoughts greatly appreciated.